22. Water Music. 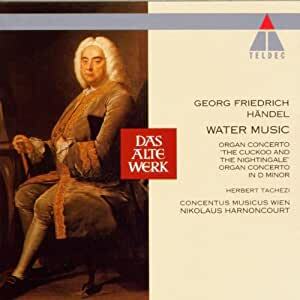 Organ Con in d, HWV 304: Adagio, Organo adagio ad libitum e poi una Fuga allegro..
As strange as it may seem, this, while being probably the craziest performance of the Water Music by Haendel, is also the one that ranks on the top of all of them. Someone commented that, had this style been really used on the first execution in front of the King, it would have blown his boat out of the water! I purchased the lp many years ago and I remember I was so shocked at the performance that on the second day I returned it to the shop to get a more traditional version. One week later, though, I had to go to the shop again and begged to have it back. I got addicted to it. You may also want to get another, more "standard" version, but this is an absolute "must". Brilliant and joyful.